RESCUE REHAB: We interrupt this blog post for a ......fire! Yesterday I finally finished rebuilding the cart I will tell you about. 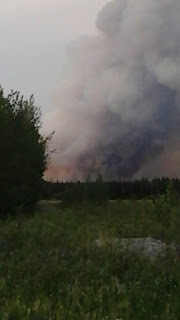 On looking up at the sky, though, I realized we had a major problem in the form of an Alaskan wildfire. Now, last year at this time, I spent many days at my cabin at the Farmer's Market, huddled around a small electric heater, and keeping out of the rain. Talk about opposites! This summer it is HOT, and so dry we are living in a tinder box. I am sure most people have heard about the current fires in Alaska. We are near one of the smaller ones. Yesterday we had some lightening strikes, near here and it started a couple of blazes that have been very hot and fast moving. Even though it is a few miles away and across a river in this picture, it looks a lot closer and believe me it is scary. Last night in the middle of the night I got a call that the fire had jumped the river to our side in a few places. We spent the remainder of the night watering everything down in case burning embers landed near. Today they hit it hard with flame retardant and it sounded as though we were listening to an old war movie with the planes flying low and noisily. I have NO problem with that at all and I think that it really helped the situation. This is the cart that I rebuilt. A family that we knew were moving away a few years ago and we got to pick their back fields that had all sorts of treasures. This had never been painted and had two sets of wheels to begin with. It had seen better days and was in a sad state. Fast forward to a few years later and I realized it was missing from the spot where I had put it. Hmmmm, a quick perusal of the burn pile(um, maybe I should be glad it has been too dry to burn that??? ), and there it was, this time in quite a few pieces...I was pretty sure I could put it back together. So, with my Ryobi drill I did just that and also put in new screws in several places to make it sturdier. I had to discard one of the axles completely, but this one, with tires was still usable, so I moved them to the middle of the cart. I added a tongue, and reinforced the tail gate with just a little bit of new wood. It balances well with the tail gate down. This is NOT a toy, or child safe. There are places where the ends of old nails stick out and it does appear that my rebuild may not have been the first. I don't think this is very old, but I wanted to keep the aged look to it, so I painted it with milk paint and I like the result. 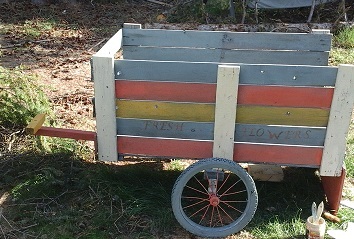 The wheels are not great and a bit wobbly, but this is supposed to look like an old peddler's flower cart. It is large enough that it would not fit in the back of my Subaru, so it will be delivered by truck on Saturday, to the cabin. This would look great with containers of flowers spilling over the sides, in a yard or garden setting. I love the colors you chose! 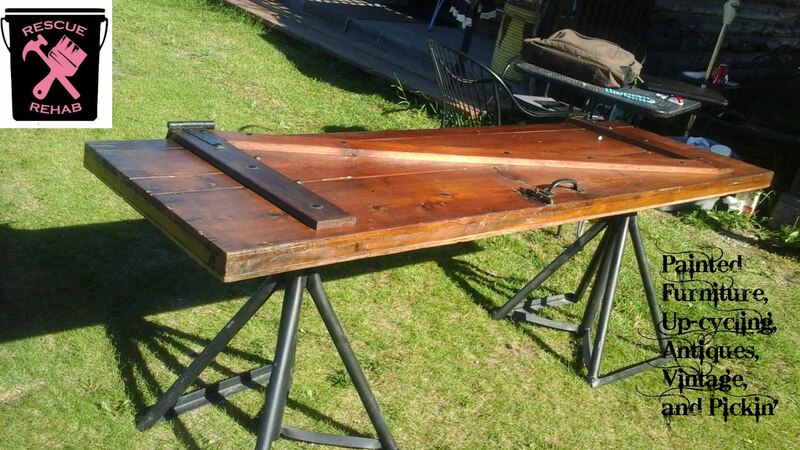 It looks straight out of Tom Sawyer. Beautiful rehab! Yes! This would look lovely in the garden with flowers, and in the fall loaded with pumpkins, the spring with a real Easter bunny, etc. Such an adorable multi purpose cart.